IT has been more than a year since Bursa Malaysia saw the first listing on its Leading Entrepreneur Accelerator Platform — better known as the LEAP Market — a complementary marketplace for small and medium enterprises (SMEs). In October last year, information technology solution provider Cloudaron Group Bhd became the first to be listed on it, followed by software products developer Red Ideas Holdings Bhd a month later. So far, a total of 11 companies have made their debut there — nine of them this year, including Metro Healthcare Bhd, Nova Pharma Solutions Bhd, Polymer Link Holdings Bhd and Amlex Holdings Bhd. The most recent was that of eye care services provider Topvision Eye Specialist Bhd last Wednesday, which also marked a milestone by raising RM12 million — the largest initial public offering on the platform to date. 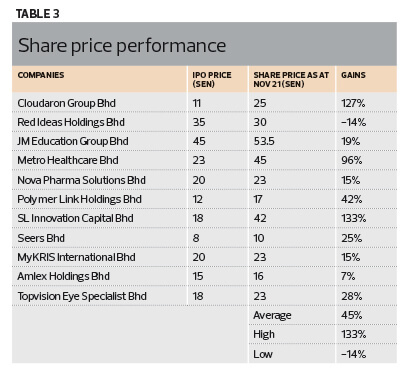 On average, the 11 companies raised about RM5.57 million from each IPO (see Table 2). The smallest was that of SL Innovation Capital Bhd, an end-to-end enterprise business solution provider, which raised RM1.89 million in May. Notably, Malaysia is the first Asean country to have a stock exchange platform for SMEs. Launched at Invest Malaysia Kuala Lumpur 2017, the LEAP Market is an alternative and efficient capital-raising platform for underserved SMEs to prove their true potential. It is seen as a stepping stone for them to transfer to the ACE Market or even the Main Market in the future. From an investment perspective, the LEAP Market provides a new investable asset class for sophisticated investors. Together with the ACE Market and Main Market, Bursa Malaysia is providing a complete range of investment opportunities, ensuring there is something for everyone. So, one year on, where is the LEAP Market today? What are the main challenges facing listed companies? What can the regulator do to further improve the so-called third board? Bursa Malaysia, when contacted, says the response to, and interest in, the LEAP Market have been very encouraging since its launch a year ago. The exchange will continue to work closely with the industry by actively promoting listings on it through outreach programmes to create awareness, it says. “To date, we have a strong pipeline with companies at various stages of preparation for listing, which will be announced in due course,” it tells The Edge in an email reply. There is growing awareness that the LEAP Market offers additional benefits besides fundraising, it notes. “For SMEs, the LEAP Market helps companies increase their visibility and profile. In addition, the adoption of a higher standard of corporate governance and disclosure requirements will ultimately contribute towards their sustainable growth over the long term,” it says. Generally, the processing period to list on the LEAP Market is relatively shorter and quicker — around six to nine months — as a company only needs to produce an Information Memorandum, whereas those seeking to list on the Main and ACE markets have to publish a prospectus. There is also no requirement for profit track records or operating history for LEAP Market listings. The Securities Commission Malaysia also does not vet listings for the market, leaving the task to Bursa Malaysia. While it may offer faster time-to-market, Bursa Malaysia stresses that prospective SMEs wishing to list need to ensure the necessary systems are in place to enhance their governance. “They require time to conduct ‘house-cleaning’ activities, which include matters pertaining to the company structure, legal compliance, regularising related-party transactions, and financial and tax compliances to get the company ready for listing,” it says. Note that trading in LEAP Market-listed companies is limited to sophisticated investors, who are categorised as accredited investors and high-net-worth entities and individuals. A sophisticated investor is someone whose total net personal assets exceed RM3 million or its equivalent in foreign currencies. Corporations, partnerships and trust companies need to have assets worth more than RM10 million. In general, SMEs and startups potentially carry a higher risk than more established companies, which is why trading is restricted to sophisticated investors. That is one reason LEAP Market companies have been seeing lacklustre trading volume. Another factor is that major shareholders are not willing to pare down or dilute their shareholdings. According to statistics sighted by The Edge, most of the companies are seeing less than 1% of outstanding shares being traded. For instance, trading volume for Metro Healthcare was 0.61% of its share capital, while Nova Pharma Solutions was 0.46%, Cloudaron was 0.4%, and Polymer Link and Amlex merely 0.02%. Red Ideas may be the exception, but even then, only 1.98% of its share base is being traded. Homegrown network service provider MyKris International Bhd managing director Chew Choo Soon opines that the biggest challenge is low trading liquidity as well as the market being restricted to sophisticated investors. “If we look at the ACE Market, it is a truly open market where everyone can trade. Because of this factor, some investors remain sceptical about the LEAP Market because they are not sure whether there will be buyers if they want to sell,” he tells The Edge. 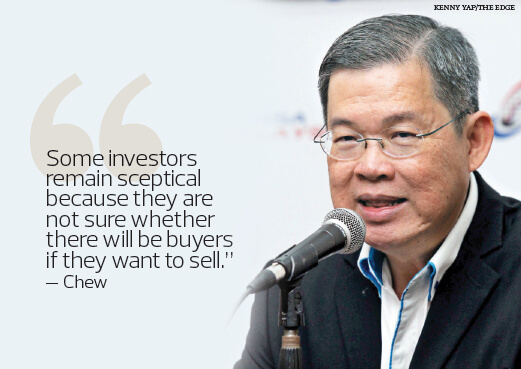 JM Education Group Bhd managing director Teh Cheong Hua, however, believes the LEAP market is for certain companies and investors with different time horizons and where trading or liquidity is not a major concern. He remains fairly optimistic about its future and says it will gain traction when the time comes and when 30 to 50 counters are listed on it. “By then, investors and funds will have a real look at the LEAP Market companies. Hopefully, we will get more coverage from research analysts and Bursa Malaysia, and then I think the liquidity will come,” he says. Homegrown water-heating specialist Seers Bhd managing director and founder Ken Foo Kwok Hsing concurs. He says LEAP Market companies need a lot of public attention and media coverage, and Bursa Malaysia should take the lead and guide them. “To me, if you are on the ACE Market, you are pretty much at a comfortable level or you can at least take care of yourself already. But if you are in the LEAP Market, you need a lot of guidance. For companies like us, we are very energetic and hungry to learn new things,” he says. Should Bursa ‘liberalise’ the LEAP Market? 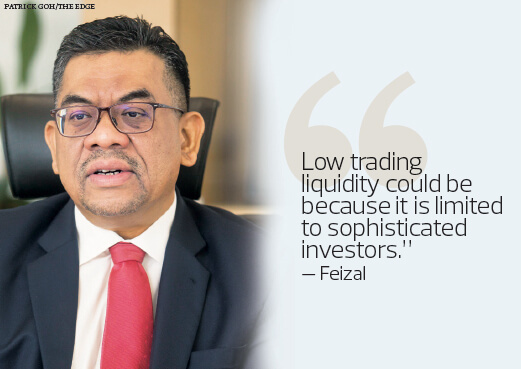 Association of Corporate Finance Advisers (ACFA) vice-chairman Datuk Feizal Mustapha says the low trading liquidity is due to the fact that permitted investors for the IPOs and subsequently, trading, is limited to sophisticated investors. This may be something Bursa Malaysia could look into to raise the attractiveness of the LEAP Market, he says. Feizal says another reason is the relatively smaller free float of the IPOs. Besides, LEAP Market counters are much smaller in size and have a relatively shorter operating history, hence making it difficult to attract active trading. 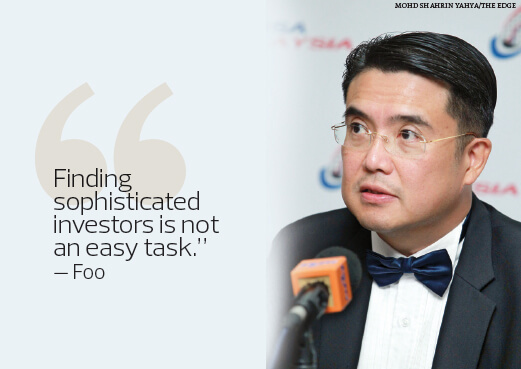 Seers’ Foo says finding sophisticated investors is not an easy task. “For the ACE Market, if I buy today and something is not right, I can sell tomorrow. But for the LEAP Market, you need to convince the investors to buy your shares and hold for the long term,” he explains. What is interesting is that corporate observers and industry players have lately started to urge the regulator to consider “liberalising” the LEAP Market by allowing non-high-net worth individuals to buy and sell the shares of the listed companies. The argument is that if LEAP Market companies achieve exponential growth, the regulator should not deny other investors the chance to invest in them. Thus, they should at least allow retail investors to trade. In response, Bursa Malaysia says it is still studying ways to enhance liquidity in the LEAP Market. “We are in continuous consultation and engagement with the relevant stakeholders, including regulators, advisers and policymakers,” it says. It acknowledges that, like in most SME exchanges around the world, SME shares tend to generally have lower liquidity, higher volatility of business performance and carry higher risks than larger and more established companies on the ACE and Main markets. “With this in mind, investor profile in the LEAP Market will evidently be different compared to investors in the ACE and Main Market,” it says. It adds that the LEAP Market framework had been conceptualised based on a lower cost of listing and speedier time to market through appropriate regulatory requirements, formulated on the basis that participation is limited to sophisticated investors. “This restriction also serves as a risk management measure to safeguard investor interests,” it stresses.